At the southern section of the N17 – the road that connects Galway with Sligo – was last month reopened as the M17 motorway, Tuam-based band The Saw Doctors mused that their nostalgic hit song, about an Irish emigrant longing to be back among the stone walls and green grass flanking the N17, would be redundant. 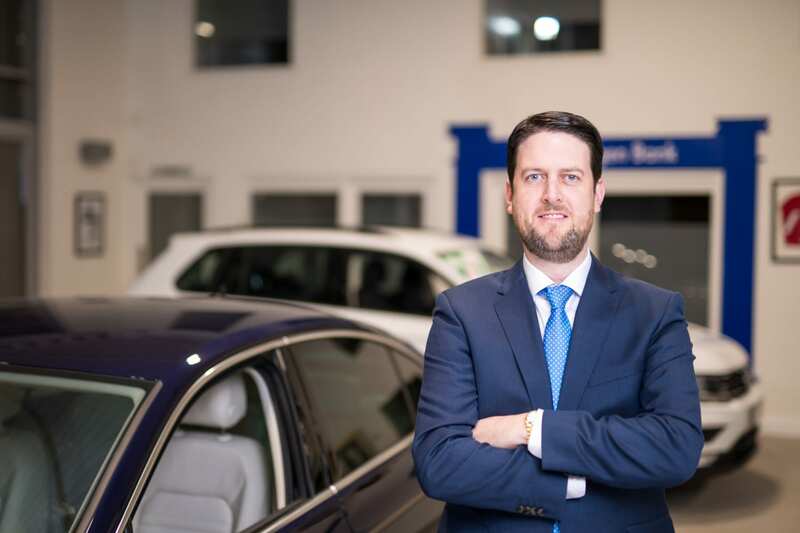 As co-owner of Connolly Motor Group, the largest motor group in the north-west, with Audi, Volkswagen and Mercedes-Benz dealerships in Mayo, Galway and Sligo, Neil Connolly has also clocked up his fair share of time on the N17. While the company’s two new dealerships in Galway may be set to benefit from the new motorway, the business’s story is one also rooted in emigration. The group was founded in 1939, when Neil’s grandfather, Thomas Connolly, opened a Fiat dealership and forecourt in Ballina, Co Mayo. Kevin Sr, Thomas’s son and Neil’s father, joined the garage as a 15-year-old apprentice mechanic and worked there until the 1960s. But, “like any rural town in Ireland at the time, there wasn’t much going on, so he went to America and started working as a mechanic”, says Neil. Kevin Sr eventually saved enough money to set up an Amoco gas and service station in the Bronx. While in New York, he met and married a Leitrim woman, Maura, and the couple went on to have three sons: Kevin Jr, Neil, and Greg. Neil was only a year old when in 1979 the family, having pursued their American dream, returned to Ireland. Back in Ballina, Kevin Sr set up a dealership three doors down from his father’s garage. Running a business in rural Ireland in the 1980s was no easy feat, but Kevin Sr’s work ethic and American-style approach to customer service helped him stand out from the competition. Kevin Sr’s tenacity paid off and in 1987 he was appointed main Volkswagen and Audi dealer for Mayo. In 1991, Kevin Jnr joined the business. Keen to follow in the footsteps of his father and older brother, Neil went straight from secondary school in Ballina to work in the dealership every day. In 1996, half an hour after finishing his Leaving Cert, Neil started working for the family business full time. The years spent working alongside his father proved to be bitter-sweet for Neil, because in 1999 his father died at the age of only 56. Neil and Kevin Jr continued their father’s legacy, by expanding Connolly Motor Group with the addition of new, high-end dealerships. In 2007, the business was appointed Sligo’s main dealer for Volkswagen and Audi, but the onset of the recession and credit crunch required a new strategy from the brothers. Unemployment, emigration, falling wages and a squeeze on car finance helped to drive the number of new cars sold in Ireland from 190,000 in 2008 to 55,000 in 2009. Dealerships across the country folded. In some ways the recession even created opportunities for Connolly Motor Group: the slump in property values enabled the Mayo brothers to buy or lease sites at lower cost than in the boom. In 2011, they opened an Audi dealership in Sligo at a cost of €3m, and a year later opened an outlet for the same brand in Ballybrit, near the racecourse in Galway. The latter is being replaced this month by a new €5m Audi centre on a greenfield site nearby. Last year Connolly Motor Group opened a 20,000-sq ft Mercedes-Benz dealership in Collooney, the Co Sligo town at the end of the N17. The €4.5m-investment created 20 jobs and transformed an industrial estate that had lain vacant since the onset of the downturn. Mercedes-Benz has also just appointed Connolly Motor Group as the main dealer for its cars in Galway, ending a six-year absence for the brand in the City of Tribes. The €5m showroom in Briarhill, near Ballybrit, will feature display space for up to 15 cars indoors and as many as 100 outside. The move will bring the group’s total workforce to 200. Indeed, the company even managed to increase its staff count during the downturn. “Other dealerships closed, so there was more of a market for us to grow into,” Neil says. “We are a family business, so we had always put a huge effort into recruiting the right staff. “Overall, jobs are not as available in the west of the country as they are in the east, so everyone was grateful for their job and wanted to make it work. One initially employed as a business manager responsible for finance became a part-time marketer and part-time salesman! While Neil spends most of his days in Sligo and Kevin is mainly based in Ballina, they exchange as many as 70 phone calls a day and both meet in Galway every Friday. The pair are counting on the Government making good its promise to extend the M17 to Mayo and Sligo to reduce the amount of time they both spend on the road. In the meantime, they are content with the potential the M17, as well as the M6 route to Dublin, could reap for their new Galway businesses. 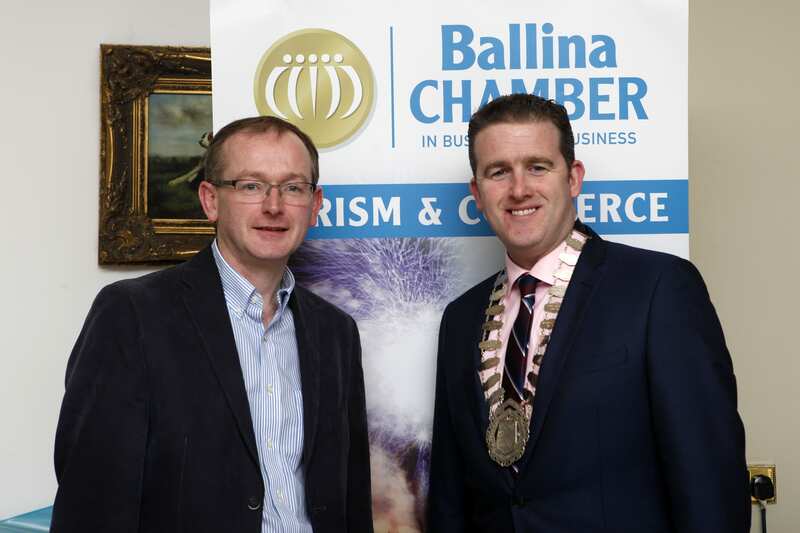 Kevin Connolly, Connolly Motor Group & President of Ballina Chamber of Commerce 2013-2015 & Current President Ballina Chamber of Commerce Paul Regan, Dillon’s Bar & Restaurant.